Ericas are beautiful fynbos plants that thrive in Western Cape gardens but can also be grown in inland gardens if you choose the right varieties. There are over 700 species of ericas, of which at least 50 are ideal for planting in the garden. 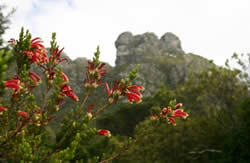 If you are a walker or a climber in the mountains of the Cape you cannot help but be intrigued by the indigenous ericas growing in abundance there. Mostly small, but sometimes large, woody shrubs, they are best recognised by their extraordinary flowers that are crafted so perfectly that they look almost artificial. 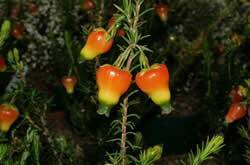 Shaped like miniature bells, their curved or puffed up tubes come in all colours except blue. The leaves are tiny and needle-like and arranged in small tufts. When choosing a site to plant ericas, keep in mind that they grow naturally in well-drained positions, although there are some exceptions which have water passing by their roots most of the time. To ensure good drainage in heavier soil, grow them in a rockery or place a layer of builder’s rubble half a metre under the soil. They also require an acid soil with a pH ranging from 4 to 5.5. The soil mix should be half good soil and half old compost. If you happen to have some Table Mountain sandstone present in your garden you have the ideal growing medium for the majority of ericas. Apart from good drainage, ericas thrive in a spot which receives sunlight and enjoy the wind through their leaves. 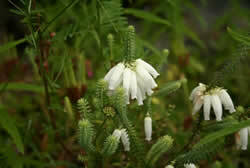 The shape, appearance or kind of erica will influence its best use in the garden. Those that are more difficult to grow are better grown in pots where they can be closely monitored. On an airy, sunny patio and properly watered, they will do exceptionally well. Many ericas start flowering at an early age and are thus perfect for containers. The best potting soil is acidic, sandy, and well-drained. Mix equal parts of pine needles, bark, river sand and a small amount of loam, and feed plants with a fish emulsion. Once you have planted your erica be careful not to disturb the soil around the plant as it has a fibrous root system and, like many of the fynbos family, hates having its roots disturbed. Careful watering is half the secret of successful erica cultivation. Ericas growing in the wild are often found at high altitudes where the south-east winds bring clouds that provide moisture in summer and rain in winter. In the winter rainfall areas of the country, water ericas during the summer if you want them to remain healthy. In the summer rainfall regions, make sure they are well watered during the dry winter months. In their natural environment, ericas are often found in close company with restios such as Elegia spp., Chondropetalum spp. and Thamnochortus spp. Those of us who prefer naturalistic plantings will enjoy them with these companions and maybe some proteas, helichrysums, agathosmas and a coleonema or three. The species that have smaller flowers are striking in mass displays, such as berry heath (E. baccans), E. quadrangularis and E. peziza. Ericas also look great in a rockery, as in nature some species have learnt to live in close proximity with rocks, sending their roots deep underneath them to find water and coolth. Albertinia heath (Erica bauera), lantern heath (E. blenna), Grahamstown heath (E. chammisonis), E. conica, E. cyathiformis, four sisters heath (E. fastigiata), E. gallorum, E. holosericea, E. nana, E. mauritanica, kapokkie (E. peziza), mealie heath (E. patersonia), Swellendam heath (E. walkeria). Water heath (E. caffra), E. deliciosa, E. formosa, E. gibbosa, E. glauca var. glauca, E. gracilis, E. lanipes, baby heath (E. quadrangularis), E. sparrmannii, E. tenella. Albertinia heath (E. bauera), E. oatesii, mealie heath (E. patersonia), E. sitiens, E. versicolor. E. densifolia, E. hirtiflora, nine-pin heath (E. mammosa), E. sitiens, wax heath (E. ventricosa). Keep the soil around ericas mulched with pine needles, chips or stones to conserve moisture and exclude weeds. 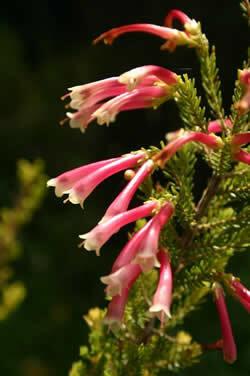 Ericas respond well to light, regular pruning from a young stage which will increase branching and flower production. Prune after flowering to avoid loss of flowering buds. Feed before flowering with a slow release 3:1:5 fertiliser or a good organic fertiliser. Ericas are not suitable for humid, subtropical gardens. 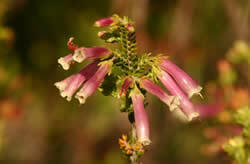 Ericas grow best if planted close together with other fynbos plants to form dense stands that cover the ground. Don’t be afraid to pick your erica flowers as they last a long time in a vase and are thus popular cut flowers both as ‘fillers’ and ‘specimens’. E. verticillata – magenta. Thought to be extinct in the wild, rediscovered and thriving. E. nana x E. patersonia ‘Gengold’ – golden yellow. Small plants, perfect in pots. 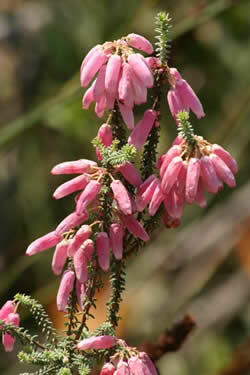 Erica ‘Candy’ protata x – a floriferous dusky pink.